These offices in central Greenwich, south-east London, were once upon a time home to an innovativee attempt by six London boroughs to share computer services. Back then, computers were very expensive and rather than own computers, local authorities would rent computer processing time. The treasurer at Greenwich Council, John Humphries, worked with colleagues to establish a new computer centre where six Metropolitan boroughs would own their computer. The computer itself was a LEO III, and the building came to be known as John Humphries House – named after the man who helped make it happen but sadly died just months before it opened. The local council retained the offices for years before they were sold into private hands, with many small businesses renting out individual offices and the car park becoming a popular vintage market at weekends. 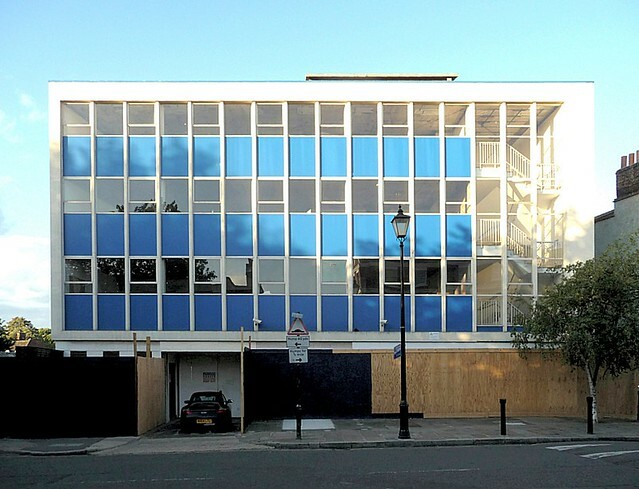 These offices are shortly to be demolished and in their place will be a new purpose built campus library and School of Architecture for the University of Greenwich. Find out more about the history of John Humphries House. This entry was posted in London and tagged Offices that used to be.... Bookmark the permalink.